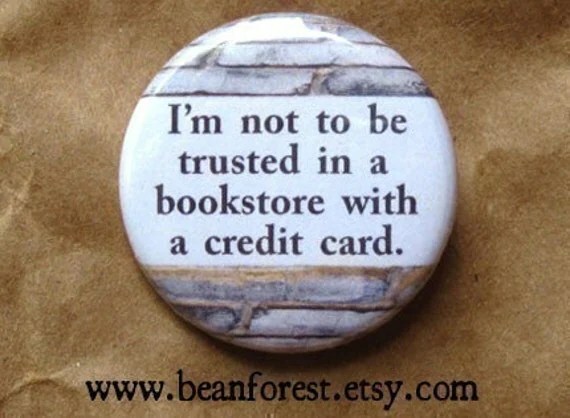 Especially at a used bookstore like Treehorn Books in Santa Rosa, CA. My mom and I took a short trip up there last fall and saw the “Books” sign in the window. You know what happened next. Of course I couldn’t resist going in. In a cheery, pedestrian-dominated downtown just off of Highway 101, this bookstore rubs elbows with public outdoor gardens, international fair-trade shops, coffee shops, and an authentic millinery store–that’s a hat shop to the rest of us. 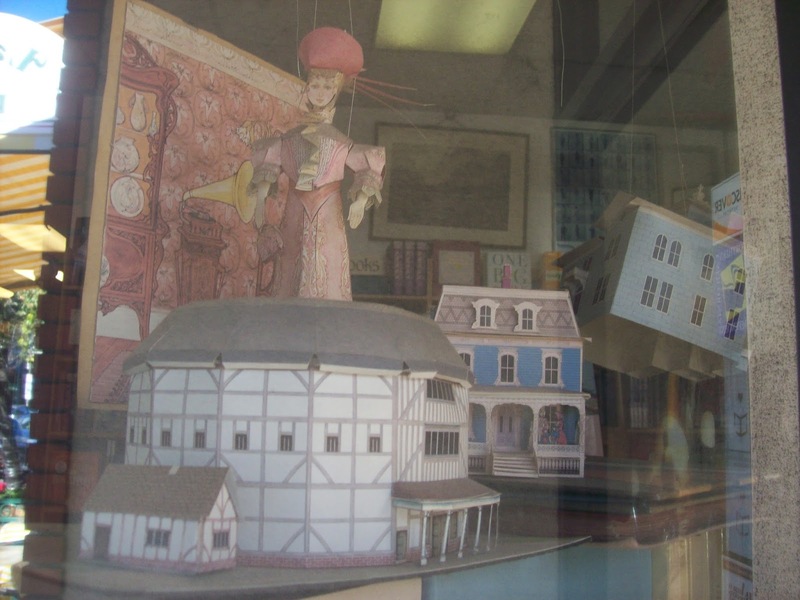 My attention was arrested right from the window, where an array of dollhouses and paper constructions, including Shakespeare’s Globe Theatre, announces the presence of whimsy and imagination (some of them are dangling from the ceiling). But of course, as with good books and good people, it’s the inside that really counts. This bookshop is much bigger than it looks on the outside. Rows and aisles and alcoves and crannies of books. No sliding ladders here, but there are some stepstools. Unfortunately, those beautiful first editions were something like $250 per book. And since I am a devoted book lover, I majored in English in college. Which meant that that purchase was not happening. So I admired that boxed set like a work of art in a museum and decided to put it on my “when I am rich and famous” list. Take heart, though! The less rare books were very accessibly priced. So if you’re ever in Santa Rosa, climb a few of the stepstools for me. 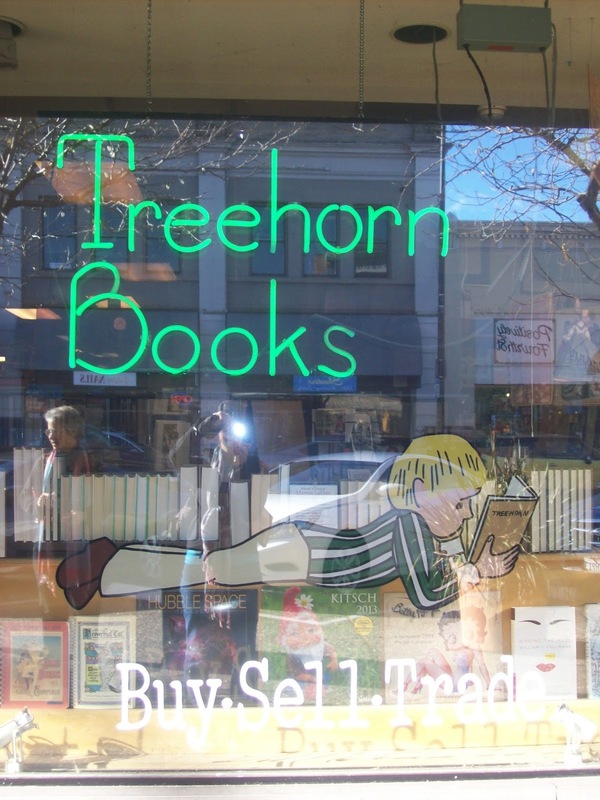 Treehorn Books is located at 625 4th St, Santa Rosa, CA 95404. They don’t have a website, but their Yelp page has all their information. If it makes you feel any better about having to pass it up, they probably weren’t true firsts – possibly the first boxed edition, but I would expect those to go for more – the true first editions go for tens of thousands of dollars for a set. Run a quick search at abaa.org (the Antiquarian Booksellers Association of American) and you’ll see what I mean. But, if it looked like what’s at this page http://www.tolkienbooks.net/php/1st-boxed-lr.php I suppose it could have been the first boxed set! 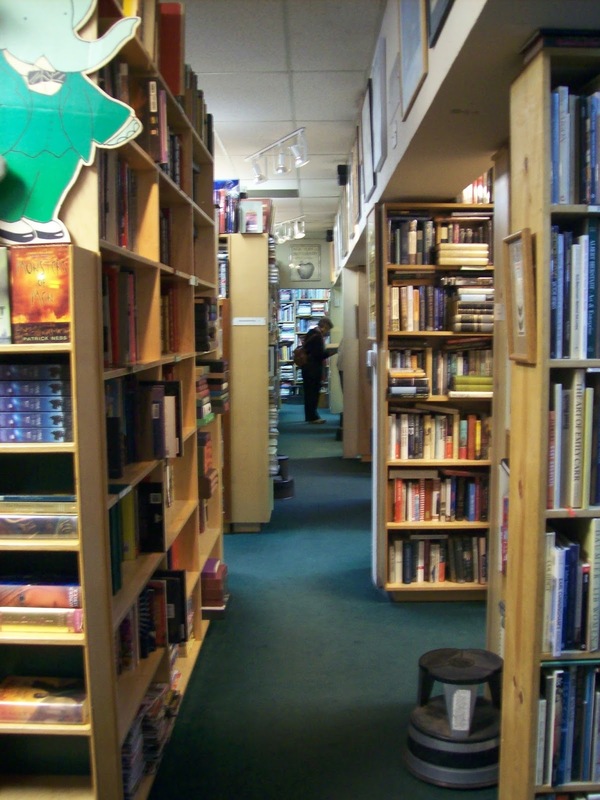 I can’t find a going price for it.Anyway, you’re lucky your mom will go book shopping with you – my dad will, but not my mom.Great post as always – I don’t often comment, but I read!